Last Minute Travel and its sister brands are wholly owned subsidiaries of Travel Holdings, Inc. We strive to make your vacation possible by providing straightforward travel products using advanced technology. www.LastMinuteTravel.com The premier online website for providing last minute prices on a variety of travel products . . . all in advance. The biggest bargain available on the site is its portfolio of 16,000 plus Undercover hotels in 2,500 major cities worldwide. 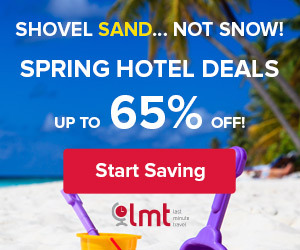 By keeping the name of the hotel quiet until after one books, LastMinuteTravel.com is able to dramatically drop the rates across every hotel - providing even better last minute prices... in advance.